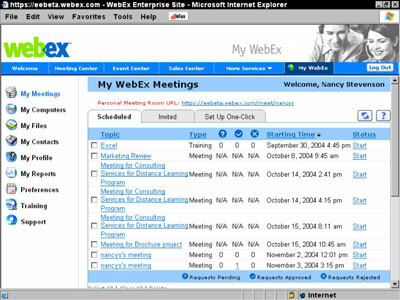 The WebEx Web Meetings software enables you to have meetings, conferences, and presentations with your clients or employees who can’t get together in person. Familiarize yourself with the Meeting Center, the My WebEx menus, and some handy shortcuts to make running your WebEx meetings more efficient. From within the WebEx Meeting Center, you can use shortcut keystroke combinations to invoke certain actions. The following table shows you all of the available shortcuts in WebEx Web Meetings. My WebEx is where you control all your user settings. 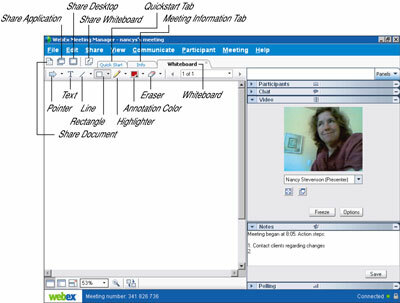 Display My WebEx by clicking the My WebEx tab on your WebEx site as shown in this figure. The following table summarizes what you’ll find on the My WebEx page.